Which Salman flick are you most looking forward to in 2012 : Ek Tha Tiger or Dabangg 2? Which Bollywood sequel are you most looking forward to in 2012 ? Which item song released recently is catchier? Do you prefer Salman Khan in "Dabangg" or "Wanted"? I was surprised out of my wits when I heard that the director of Dabangg – Abhinav Singh Kashyap – is the brother of maverick experimental filmmaker Anurag Kashyap; and I’m damn sure it’s not just me – there would be a whole lot of other movie buffs that would react this way, this Kashyap having taken a complete 360 degree turn from his brother’s eccentric filmmaking touch in all of his films. Getting back to the point though, Dabangg ends up being one of the most anticipated films because of three important factors – Salman Khan, the craziest promotion ever, and of course the whole acuriosity attached with Shatrughan “Shotgun” Sinha’s daughter Sonakshi’s entry in the Hindi Film Industry. Does Kashyap deliver? Will Salman get lucky this time? Chulbul “Robin Hood” Pandey is a lovable, though corrupt, police officer who does things his way and looks at life with a completely different set of perspectives. Unbeatable, unbreakable and sophisticated in a very “raw” manner, Pandey still has a soft heart for the public, which in turn respect him. He falls for Rajo and starts a whole new vendetta with Chhedi Singh. With so many truths still keeping him in the dark, will he fall apart coming to know them or will he survive? For a masala film, the story is perfect, and the screenplay is razor-sharp and so quick you’re left with no time to breathe. Dialogues are powerful and very well-written. Character sketches though turn out to be the most important and the most vivid part of the film. The colorful character of Chulbul Pandey has been so well-written anybody would fall for his charming but raw personality. Subplots are commendably woven into most part of the screenplay and don’t look out of place. If the writing is excellent, the execution by Kashyap is top-notch. Aadmi mein dum hai. He handles each scene with so much finesse that you’ll end up getting gripped with the whole film. I can’t wait to see what Kashyap intends to direct next. Technically, the movie is top notch. Mahesh Limaye’s cinematography captures the raw, gritty essence of the film where it’s needed, and also ends up beautifying the more romantic scenes. Camerawork is terrific. Action by Vijayan Master (who coincidentally also choreographed the action of Salman’s last hit Wanted, which also fits into the same genre) is mind-blowing, and the edit of the action by Pranav V Dhiwar makes the sequences so stylish it has the wow factor attached to it. The music of the film is fun and frothy when needed and soft and classy when needed. Numbers like “Munni Badnaam” and “Hud Hud Dabangg” are powerful because they contain terrific visuals, which do not elude romantic songs like “Tere Mast Mast Do Nain” and “Chori Kiya Re Jiya”. Visual effects are realistic and sophisticated at the same time. Coming to the performances, Dabangg would surely be incomplete without Salman Khan. The arrogance and chutzpah mixed with a more childish and cute personality that he has exuded throughout the film has been brought to life with such elan you have to admit that Salman’s the star performer in the film. New entrant Sonakshi Sinha impresses and shows that acting’s in her blood with her short but powerfully portrayed role. Sonu Sood is convincing as the malicious antagonist. Vinod Khanna is his usual powerful self in this short supporting role too. Arbaaz Khan is convincing. Others like Tinnu Anand, Om Puri, Mahie Gill, Dimple Kapadia and Anupam Kher are efficient. 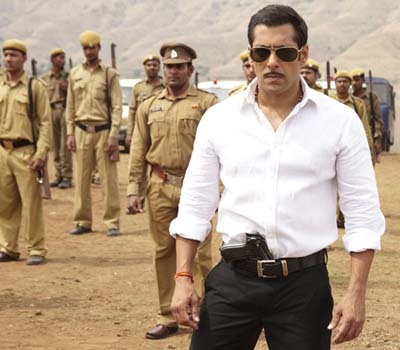 On the whole, Dabangg impresses, and how! Sure it’s not Wanted but it’s much better than it in terms of execution, editing, styling, performances and structure of the whole film. Via the barrage of parallel cinema coming out in Hindi film through new directors like Ayan Mukherji ( Wake Up Sid) and other more experienced ones like Kashyap’s brother Anurag (Dev.D), this movie turns out to be a hugely pleasant surprise for people thirsting for non-stop entertainment for the whole of two hours in a film. As a final word, all I can say is go grab the tickets, take a huge tub of popcorn and coke, and sit back and relax- you’re sure to be saying by the end of the film: movie sahi hai boss!